Rick Neuheisel may not ever coach a game against the Ducks again. You might recognize his Bruins from any number of recent uninspiring performances such as last Thursday, where they were blasted on ESPN by a newly Stoops-less Arizona team 48-12. It was the first conference win this season for the Wildcats. After the game, Slick Rick seemingly was in a hurry to publicly lobby for his employment status by saying “My argument is that I am absolutely the right guy for the job, I look forward to continuing that quest”. As convincing as that might sound, his team has again underwhelmed so far this season, and the guess here is that he has just about worn out his welcome in Westwood. Over the years, very few personalities on any opposing team have irritated Duck fans as much as the hatchet-faced former UCLA player and current head coach has. There is some distinct history here, so let’s take a moment to reflect back on some of the most memorable incidents from the coach that Duck fans have loved to hate. The most recent results have also been the most favorable. The Ducks have enjoyed a victory in each contest between the schools since Neuheisel took over after serving as offensive coordinator for the Baltimore Ravens. The games in 2008 and 2009 were mostly competitive but the 2010 game was particularly enjoyable, with the Ducks rolling 60-13 at Autzen. Under his watch, the Bruins have finished the season ranked 8th twice and 9th last season in the Pac-10. 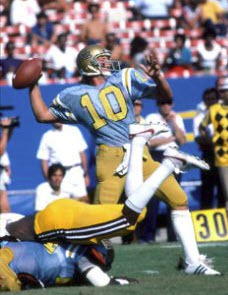 Rick Neuheisel as Bruin QB. He would wind up deserting the Colorado faithful the next season and was hired to become the head coach in Seattle, where the Huskies had just fired Jim Lambright. The move made him one of the highest paid coaches in college football. After the announcement, Rick tried reassuring the Colorado fans of the sudden move by explaining “I am not motivated by money, although that may sound funny now”. Rick Neuheisel with the Huskies. When Neuheisel was first hired as head coach, it seemed like a match made in hell for Oregon fans. It was the most hated coach going to the most hated rival. In his first year, the Huskies defeated the Ducks 34-20 in Seattle, one of only 3 losses for the Ducks that year. In 2000, Oregon would get revenge in the head to head battle and win in Eugene 23-16. However, the Ducks would stumble in a Civil War game that still gives me a stomach ache. This created a 3 way tie at 7-1 in conference play between the Ducks, Beavers and Huskies. The tie-breaker system sent the Huskies to the Rose Bowl which they won, and put the Beavers in the Fiesta Bowl as a BCS at large selection. The Ducks were relegated to the Holiday Bowl where they made the best of it, beating Texas 35-30 in a game that still stands as one of Oregon’s best Bowl wins. The Ducks and Huskies did not play in 2001, allowing the Huskies to avoid playing one of the best teams in Oregon history. 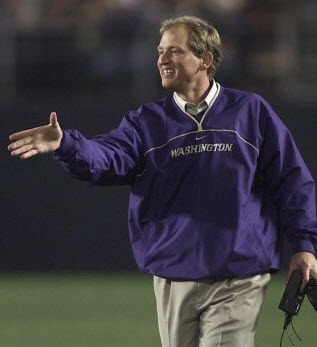 Neuheisel would return to Eugene in 2002 when one of his more memorable displays would occur. In the week leading up to the game, Neuheisel was quoted as calling Oregon “A propaganda machine”, but later said he meant it as a compliment. Either way, Oregon fans and Mike Bellotti took exception to the remark. The rivalry was strong, as the Duck Shop had even created anti-Neuheisel shirts for the game that read ‘Slick Rick Neu-Weasel’. The Huskies would be too much for the young Ducks on that day winning handily 42-14. After the game, Neuheisel ordered his team back onto the field to dance and celebrate the victory on top of the ‘O’ at the Autzen 50 yard line. The players yelled at the departing Oregon fans, took pictures, and chanted “Whose house is this? The Huskies’ house! !” The disgusting display lasted for nearly 30 minutes after the game. In response, Mike Bellotti said that the type of celebration was not something he would “condone” and said he felt it was done “in very poor taste”. Basically curse words for the otherwise mild-mannered Bellotti. After the season Neuheisel would find himself fired as head coach after participating in an illegal NCAA basketball pool, and subsequently lying about it to investigators. Oregon had just come off of a berth in the Rose Bowl and was playing in a New Years Day Bowl for the 2nd straight year. Colorado came in as the #7 team in the country boasting a high powered #6 ranked offense in Neuheisel’s first year. Oregon started strong, and jumped out to an early lead, but mistakes eventually did the Ducks in, losing 38-6. Late in the 4th quarter, with the game all but decided at 31-6, the Duck defense got a hard-earned stop and Colorado sent in the punt unit on 4th & 14. Instead of punting, Neuheisel called for a fake, which worked for 28 yards. A few plays later, Colorado scored on a quarterback bootleg to pad the final margin of victory. When asked about it after the game, Neuheisel offered “We faked the punt because they were lined up to block the punt”. Colorado finished #5 in the final rankings that season. 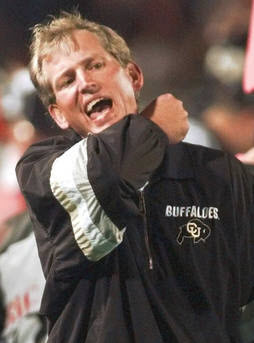 Neuheisel would post a 33-14 record with the Buffs. After his departure, Colorado was found to have been playing with an ineligible player and was forced to vacate the 5 wins from the 1997 season. Since the Cotton Bowl 15 years ago, Rick Neuheisel has placed himself in a unique light in the minds of Oregon fans. Perhaps no other opposing coach, team, player, or fan base has provoked the type of competitive emotion out of Duck fans for as many years as he has. The Ducks are not scheduled to play the Bruins this season or next. While his fake punt in 1996 may have started the rift, there is now a very good chance that 60-13 result in 2010 is what will end it. If that outcome ends up being the final chapter, so long Rick. And hey, Scoreboard, baby!